Rachel Williams on a never-ending performance of gender and identity. Standing in the middle of the exhibition, I am torn between two centuries. To the north, self-portraits of Claude Cahun against a backdrop of her sea-facing garden in post-war Jersey fill my field of view. Cahun appears hooded and caped with arms outstretched, creating an uncertainty over whether she will fly or fall. To the south, a young Gillian Wearing dances in the middle of Peckham’s Aylesham Centre – a south London shopping centre now unrecognisable post credit-crunch and the later wave of gentrification. She dances uninhibitedly as passing shoppers provide a range of reactions, from unapologetic stares to quickly stolen glances, reproduced here on a small television screen. ‘Behind the Mask…’ draws together two artists with almost a century between them but a shared exploration of identity through masquerade and performance. The masks used are physical, digital and surreal. Throughout, the artists challenge us to think of the masks we wear ourselves, how they are constructed, and who we are behind them. That is, if there is anything behind the mask at all. Many of the masks challenge the social construction of gender and betray its falseness and fragility. Cahun is referred to in academic literature and throughout the exhibition using the pronouns ‘she’ and ‘her’, however, Cahun identifies herself as ‘neuter’ rather than masculine or feminine in her written work, Disavowals. 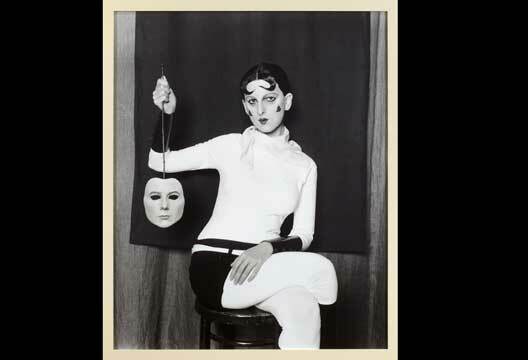 Today, Cahun’s work reflects experiences of life outside of the gender binary. Trans and non-binary people are constantly under threat – trans women are the most murdered minority in the world – and accused of deceiving the world as to their ‘true identity’. Using masks, Cahun and Wearing push us to understand that all identities are constructed and shaped over time, from childhood to death. The truest reflection of ourselves will always be a mask. Some of the most striking photographs in the exhibition are Wearing’s portraits of herself in the guises of her family and younger self. Wearing emulates the looks of her parents, grandparents, siblings and three-year-old self. In the gallery book, she explains that the photograph she receives the most questions about is her portrayal of her brother. She recalls the heavy full-body suit she used to create a snapshot of time in his bedroom while he toured with a band. In this photograph, Wearing is behind the mask but her brother has designed the mask for her – his individuality is worn on his body through his distinctive hair and tattoos. Wearing’s masks are perfect except for the subtle border around the eye. In every photograph, the eyes are commanding and direct – they make the viewer uncomfortable as you are forced to recognise the humanity within. If we can see a mask, its power is revealed. And if we realise we are wearing a mask, we gain the ability to remove it. The exhibition is part of a season at the National Portrait Gallery exploring art, gender and identity: see www.npg.org.uk/whatson/i-am-me/home. - Illustration: Me as Cahun holding a mask of my face by Gillian Wearing, 2012; © Gillian Wearing, courtesy Maureen Paley, London; Regen Projects, Los Angeles; Tanya Bonakdar Gallery, New York.